We hope that you’re doing well and enjoying the a little extra sunshine each day as we move closer to spring! 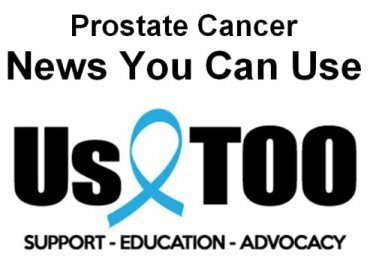 Article titles for PROSTATE CANCER NEWS YOU CAN USE are listed below along with a link to the Us TOO web page that provides access to the full text for each article. If you haven’t already done so, we encourage you to check out recorded video from the Us TOO 2018 Pathways educational events in Seattle, WA, Englewood, NJ, and Chicago, IL. In addition to a wide spectrum of presentations from medical experts, some highlights are noted below with links to video segments specific to each topic. This content was presented by Us TOO in response to 2018 survey feedback received from Us TOO support group leaders. We extend our thanks to Pathways presenters, corporate sponsors, support group leaders, and all who attended in person and online through the live webcast. If you are the wife or female partner of a man with prostate cancer , we invite you to join a conference call to connect with other women facing the same challenges. Because prostate cancer is a couple's disease, the woman is often subject to her own concerns in addition to those she shares with her partner. A Forum for Her is an ongoing series of conference calls that provides women with important peer-to-peer support. Two calls are scheduled for Wednesday, February 27, at 12:00 pm and 6:00 pm Central Time. To register, email terril@ustoo.org or call 877-978-7866. If you’ll be near Fort Myers, FL, on Saturday, March 2, plan to attend Prostate Cancer TODAY; Living Well, Choosing Wisely – FLORIDA . This educational event is presented by Prostate Cancer International and features panel discussions, audience Q&A, and breakout sessions. Get the details and register online or call Jan at (239) 208-4400. Join Cancer Care in partnership with the National Alliance of State Prostate Cancer Coalitions (NASPCC) for a 15-week online support group for men being treated for prostate cancer. Get more information and register. On June 8, The California Prostate Coalition and UCSF Helen Diller Family Comprehensive Cancer Center will present The 2019 Patient Conference on Prostate Cancer . For information, email vegstan2@ix.netcom.com or mgrey@ucsd.edu . The Oncotype DX® Genomic Prostate Score®(GPS™) test provides critical information to help guide treatment decisions for early-stage prostate cancer patients ; read press release . The recent study was published in Urology . Take care, stay warm, and watch for the March 2019 issue of the Us TOO Hot SHEET newsletter coming soon. Let us know how we can help provide you with educational resources, support services and personal connections to others in the prostate cancer community.